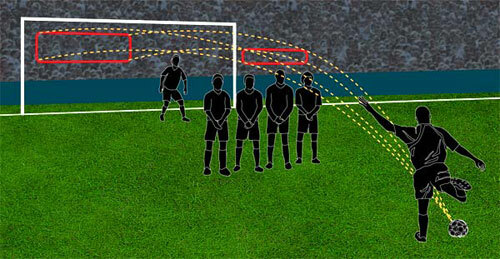 A football’s trajectory is complex and sometimes chaotic, according to the theory of aerodynamics. Unlike a streamlined projectile that describes a perfect parabola, the ball deforms when kicked which gives the ball initially a wobbly movement.When the football is kicked hard enough for the airflow over the surface to become turbulent, then the drag force remains small and the ball will really fly. To make a ball curve give it lots of spin by hitting it off-centre. This is easier on a dry day than on a wet day, but can still be done regardless of conditions. Like a snooker player this required much practice. In 1997, Roberto Carlos (Brazil) amazed fans and players, when he took a free kick approx. 30 m from his opponents’ goal and slightly to the right. Carlos hit the ball so far to the right that it initially cleared the wall of defenders by at least a metre and made a ball-boy, who stood metres from the goal, duck his head. Then, almost magically, the ball curved to the left and entered the top right-hand corner of the goal. According to experts, Carlos kicked the ball with the outside of his left foot to make it spin anticlockwise as he looked down onto it. Conditions were dry, so the amount of spin he gave the ball was high, perhaps over 10 revolutions per second. Kicking it with the outside of his foot allowed him to hit the ball hard, at probably over 30 ms–1 (70 mph). The flow of air over the surface of the ball was turbulent, which gave the ball a relatively low amount of drag. 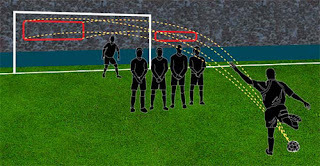 Around the 10 m mark (or at about the position of the wall of defenders), the velocity of the the ball dropped such that it entered the laminar flow regime. This substantially increased the drag on the ball, which made it slow down even more. The sideways Magnus force, significantly enabled the ball to bend towards the goal. As the drag coefficient increased this led to greater sideways force and caused the ball to bend further. Finally, as the ball slowed, the bend became more exaggerated still until it hit the back of the net. Researchers are also interested in finding out how a footballer actually kicks a ball. The study is called the kinematics of kicking and different research centres have concentrated on diffierent aspects of the same phenomenon e.g., ignoring the forces involved and taking the forces involved into account.